Get all eyes on your brand with some of ePromos' personalized sunglasses! They're the perfect giveaway at outdoor festivals, events and conferences. Stylish promotional sunglasses will have people recognizing your logo every time the sun comes out. We have a variety of sunglasses types, from aviators and Wayfarer to Ray Ban-styled frames. Your clients, employees and event attendees will be looking good - almost as good as your logo! Stylish promotional sunglasses that feature a half-lens frame in your choice of 3 colors. These Woodtone Custom Sunglasses make a great giveaway for summer festivals, beach parties, and travel agencies! They feature UV400 protective lenses. Classic shape, trendy colors! These Gradient Promotional Sunglasses are eye-catching and come in 8 fun colors. They feature UV400 protective lenses. These Rubberized Solid Color Custom Sunglasses are high quality construction sunglasses made of durable recycled plastic. These Ray-Ban style custom sunglasses are a perfect summer promotion or creative way to promote your upcoming event. Choose from a wide variety of vibrant colors! Protect your eyes with these Gradient Tinted Lenses Custom Sunglasses. Its colorful gradient lenses will protect your eyes from the sun while giving you some great style. The Two-Tone Lifeguard Style Custom Sunglasses make any summer day even better. They help protect you from the harmful effects of the sun while always looking super stylish. Promotional Sunglasses are a stylish and classy fashion handout. Show off your sense of style and your brand with these sporty custom sunglasses imprinted with your logo, team or event. These trendy style custom sunglasses feature a clear, translucent face with your choice of colored arms. These super cool silver mirrored custom sunglasses for a great summer giveaway recipients will be lining up to get their hands on. Hit the streets in style with these Surfer-Style Rubberized Promotional Sunglasses. With its wide temple design you choose the arm color to show off your brand in the sun. Hunting, fishing and outdoors enthusiasts will love receiving these unique True Timber camouflage custom sunglasses imprinted with your logo. 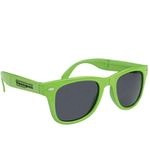 Logo sunglasses are a cool summer promotional item especially when the sun is out. Unique woodtone promotional sunglasses are made of durable recycled plastic and gives your logo or event a down-to-earth feel. Enjoy a day in the sun and promote your business with these matte finished logo sunglasses available in a variety of colors. Retail style promotional sunglasses are made of durable recycled plastic and feature a trendy tortoise finish. Reflect success while wearing these custom sunglasses that feature a black frame and a mirrored lens! Available in metallic colors, these custom sunglasses are sure to be a hit at your next event or promotions! Crack open a bottle while shading eyes from the sun with these 2-in-1 custom sunglasses that include a bottle opener on the end of each side! Custom Microfiber Cleaning Cloth w/ Imprinted Case - 5.4" x 6.3"
A custom microfiber cloth for cleaning reading and sunglasses, cell phones and laptop screens. Great promotional item for vision centers, banks and retailers. Color changing UV-protective promotional sunglasses with your logo for a hot summertime promotion! Add a cool and hip vibe to your brand message with these trendy color mirror aviator custom sunglasses. Show off your style with these Mix-n-Match Custom Sunglasses. You choose the arm and frame color that best fits your style. Promotional sunglasses are an indisputable marketing tool due to universal demand and popularity. Whether spending a day at the beach or hitting the slopes, if the sun is visible year-round, so is your brand. As they make great handouts for people of all ages, sunglasses ensure that your brand gets widespread exposure. That might not be possible with other, more niche promotional items. Our custom sunglasses are cost effective, allowing you to order in bulk without breaking the bank. With an assortment of colors and styles, you can rest easy knowing your corporate identity guidelines are fulfilled. Our brand specialists will ensure your artwork looks as sleek as possible. Impress recipients with a strategic accessory, like branded sunglass cases and cleaning supplies. Your audience will appreciate the extra thought that went into these useful accessories. Start browsing our inventory of sunglasses to find one that fits your needs. Get in touch with our brand specialists for advice on how to design yours to brighten your clients' day!